Printed calculators make excellent promotional products both because of their practicality but also because they find a place at every desk and office. Allbranded stocks a vast range of branded desk accessories including but not limited keyrings, pens, pencils, mugs, and printed USB sticks. Why not allow your target audience to remember your brand day in day out when starting their workday and at every calculation made? Calculations are part of everyday life; why else would these products have a place both at work and at home? Much like promotional pens, mugs, bags, folders and promotional sticky notes the calculator is a necessity in a day and age where we constantly have to juggle numbers. As professional marketing experts we see the potential in an everyday item such as this and are willing to show you why! Acting as an excellent brand ambassador at every use, displaying your very own corporate logo; promotional calculators will go a long way in reaching new leads. The abacus was the first hand operated mechanical calculator using beads on rods. These were first used by Sumerians as well as Egyptians around 2000 BC and enabled faster addition and subtraction than mental maths. In the 17th century, the first mechanical calculators began to appear in Europe, using logarithms invented by John Napier and adopted by Edward Gunter, William Oughtred and others to develop the slide rule. The slide rule was a sliding stick that used logarithmic scales to allow rapid multiplication and division. Slide rules evolved to allow advanced trigonometry and logarithms, exponentials and square roots. In the 1980s, the rise of electronic calculating machines were created but the slide rule continued to be used of core maths for schoolchildren due to its far more compact and portable nature. Different shapes; e.g. rectangular, swing etc. Whether you are getting ready to calculate your taxes or doing some calculations for work; our branded calculators not only do the maths for you but promote your brand in the most reliable and functional manner. Our variety not only ranges in aesthetics such as shapes and colours but also functions; to work as both rulers as well as a calculators or if you prefer to set yourself apart and go for the wooden, retro looking accessory; we have it all. If you are looking for greater, customised desk accessories, consider our varieties of keyrings, pens, mugs, bags and holders. So whether you are working in the sales department or studying for your maths exam, our variety will make sure you are covered in more ways than just one. Our high-quality printing means your corporate logo is displayed to its optimum design and make sure you get the most of it by considering colour contrasts for excellent visibility and pens your brand into memory. 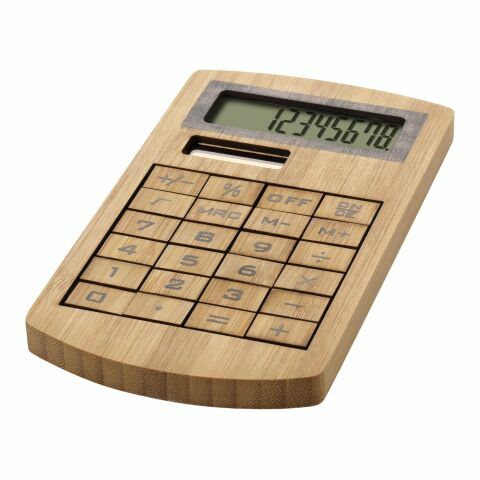 Our printed calculators are durable, much like our promotional keyrings, pens, pencils, holders, mugs, umbrellas, eco-friendly bags, folders, lanyards and usb-sticks and we guarantee their advertising effect. As marketing professionals we know what works and what doesn’t and items of high practicality, visibility and aesthetics make these top of the range. Thus giving these out at giveaways, whether at exhibition booths, events or among your own office; our variety will always find use, particularly in combination with our pens, mugs and keyrings. Have you considered distributing these items at schools and/or colleges and create an association with education? Your desk is not complete without and we offer you a wide variety to find the one most suitable to promote your brand. So whether you are looking for promotional pens, bags or promotional products of any sort, do browse our website for your marketing campaign today at allbranded.